Stock levels depend on popularity. Some items are limited stock. Any Business, Any Use! 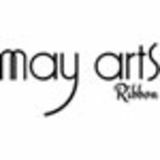 May Arts’ ribbons are used in design, packaging, fashion, manufacturing, for resale and more. Selling ribbons in your store opens a world of opportunity to reach consumers interested in crafting, home decor, sewing, and creating exceptional gift wrap. Sell by the yard or by the full roll to increase profits and customer satisfaction. We Send FREE Samples We are happy to send customers samples of our ribbon. Customers can request samples via phone, email, live chat, or in the “notes” section of an order. Sample requests, on average, are sent within seven business days. Timing may vary depending on order and sample request volume. A fee will be charged for large number of sample requests. can register online through www.mayarts.com/register. Prepay, Credit Card (Visa/MasterCard/Discover/American Express) or pre-approved net terms. Stunning Variety of Ribbon, Trims & More May Arts Ribbon carries a complete selection of unique designs and quality ribbon that includes sheer, satin, burlap, grosgrain, and silk in a variety of prints and patterns. Shop our stunning lace, or explore different ways to craft with our adhesives. 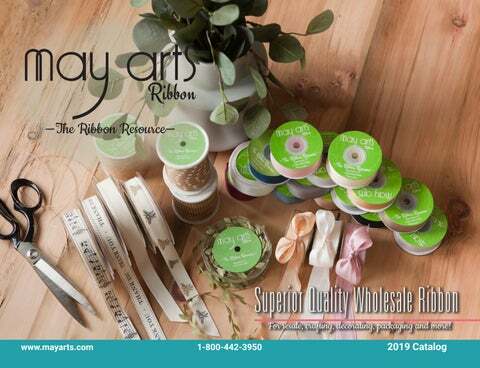 With over 4,000 variations of ribbon and trim in stock, May Arts is the leading ribbon choice for customers looking to make their product line stand out. Shipments May Arts ships domestically, as well as internationally. We offer Ground, Next Day Air, 2 Day Air, 3 Day Air Shipping. We can also use your shipping account. Requests for individual shipping accounts can be made to a customer service agent, or in the “notes” field when purchasing online. For more information about shipping timetables, please visit the “FAQ” section on the website. We pick, pack and ship most orders SAME DAY unless a future ship date is requested. Warehouse/Showroom Shipping is FOB 2780 Limekiln Pike Glenside PA 19038. In the vicinity of Philadelphia? We would love to host you for a visit to our showroom! Returns & Exchanges May Arts accepts returns and exchanges of unused merchandise within 30 days of the date the product was received. Just include the invoice with the return in order to be processed. A 15% restocking fee will be applied. Returns are for store credit only. Special Orders - From Custom Printing to Custom Roll Sizes	For special orders please call us directly so we can work with you to find the perfect product for your business needs. This includes custom printing on ribbon. For volume pricing, or inquiries about different roll sizes, please contact support@mayarts.com. See our “FAQ” section online for other information on shipping, backorders, and more! Prices subject to change without notice. May Arts reserves the rights to bill shipments at current prices in effect at time of invoicing. All 15ft mini rolls, branded for the holidays, packaged for retail. Sold in case packs of 4 rolls per design. Request free samples any time!